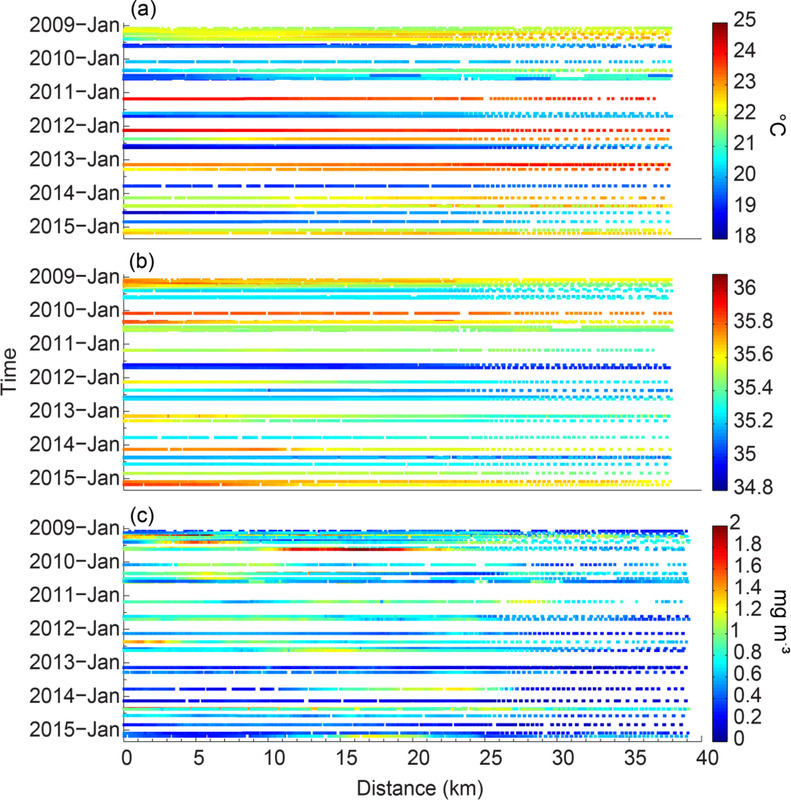 Seasonal and inter-annual variability of water column properties along the Rottnest continental shelf, south-west Australia Seasonal and inter-annual variability of water column properties (Rottnest continental shelf) Miaoju Chen et al. A multi-year ocean glider dataset, obtained along a representative cross-shelf transect along the Rottnest continental shelf, south-west Australia, was used to characterise the seasonal and inter-annual variability of water column properties (temperature, salinity, and chlorophyll fluorescence distribution). All three variables showed distinct seasonal and inter-annual variations that were related to local and basin-scale ocean atmosphere processes. Controlling influences for the variability were attributed to forcing from two spatial scales: (1) the local scale (due to Leeuwin Current and dense shelf water cascades, DSWC) and (2) the basin scale (El Niño–Southern Oscillation, ENSO, events). 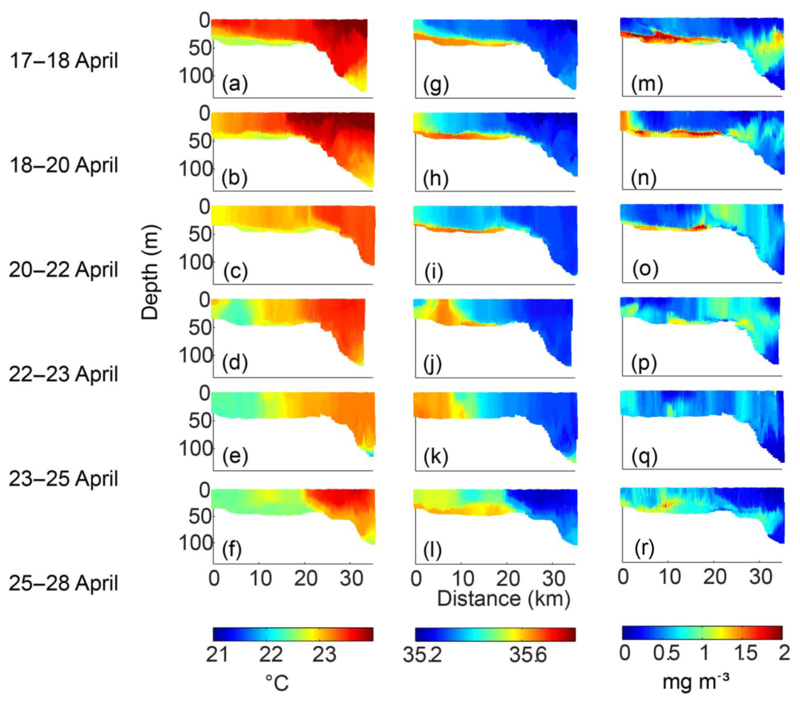 In spring and summer, inner-shelf waters were well mixed due to strong wind mixing, and deeper waters (>50 m) were vertically stratified in temperature that contributed to the presence of a subsurface chlorophyll maximum (SCM). On the inner shelf, chlorophyll fluorescence concentrations were highest in autumn and winter. DSWCs were also the main physical feature during autumn and winter. Chlorophyll fluorescence concentration was higher closer to the seabed than at the surface in spring, summer, and autumn. The seasonal patterns coincided with changes in the wind field (weaker winds in autumn) and air–sea fluxes (winter cooling and summer evaporation). Inter-annual variation was associated with ENSO events. Lower temperatures, higher salinity, and higher chlorophyll fluorescence (>1 mg m−3) were associated with the El Niño event in 2010. During the strong La Niña event in 2011, temperatures increased and salinity and chlorophyll fluorescence decreased (<1 mg m−3). It is concluded that the observed seasonal and inter-annual variabilities in chlorophyll fluorescence concentrations were related to the changes in physical forcing (wind forcing, Leeuwin Current, and air–sea heat and moisture fluxes). 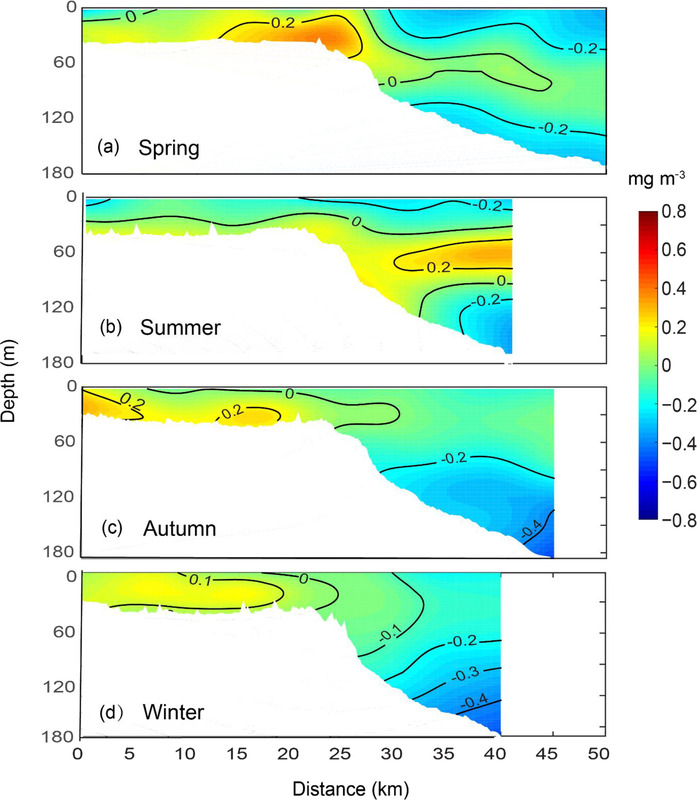 Chen, M., Pattiaratchi, C. B., Ghadouani, A., and Hanson, C.: Seasonal and inter-annual variability of water column properties along the Rottnest continental shelf, south-west Australia, Ocean Sci., 15, 333-348, https://doi.org/10.5194/os-15-333-2019, 2019. Almost all life forms rely on primary production, directly or indirectly, to survive, and phytoplankton in the ocean perform most of the primary production (Field et al., 1998). Among the phytoplankton pigments, chlorophyll a (denoted as chlorophyll in the following description) is an important biological indicator of phytoplankton biomass in the water column. Environmental variables – such as light availability (Sverdrup, 1953; Huisman and Weissing, 1994), water temperature (Eppley, 1992; Hambright et al., 1994; Paerl and Huisman, 2008), and salinity (Karsten et al., 1995) – affect phytoplankton biomass variability. Seasonal cycles of phytoplankton concentrations are identifiable signals of the annual growth activity in pelagic systems (Cebrián and Valiela, 1999; Winder and Cloern, 2010). In many parts of the world a spring bloom – an increase in phytoplankton concentrations in response to seasonal changes in temperature and solar radiation – is common and is usually present for a few weeks to months (Cushing, 1959; Pattiaratchi et al., 1989). Often a secondary peak in production develops in late summer or autumn (Longhurst et al., 1995). These seasonal phytoplankton patterns have large inter-annual variability across different geographic regions (Cebrián and Valiela, 1999; Cloern and Jassby, 2008; Garcia-Soto and Pingree, 2009). Satellite and field-based measurements have shown that in the oligotrophic waters off south-west Australia, the seasonal chlorophyll cycle (a proxy for phytoplankton biomass) is different from that in other regions with a clear peak in chlorophyll concentrations in late autumn or early winter and minimal levels in spring and summer (Koslow et al., 2008; Thompson et al., 2011; Lourey et al., 2012). Pearce et al. (2000) found higher chlorophyll concentrations on the continental shelf than further offshore. 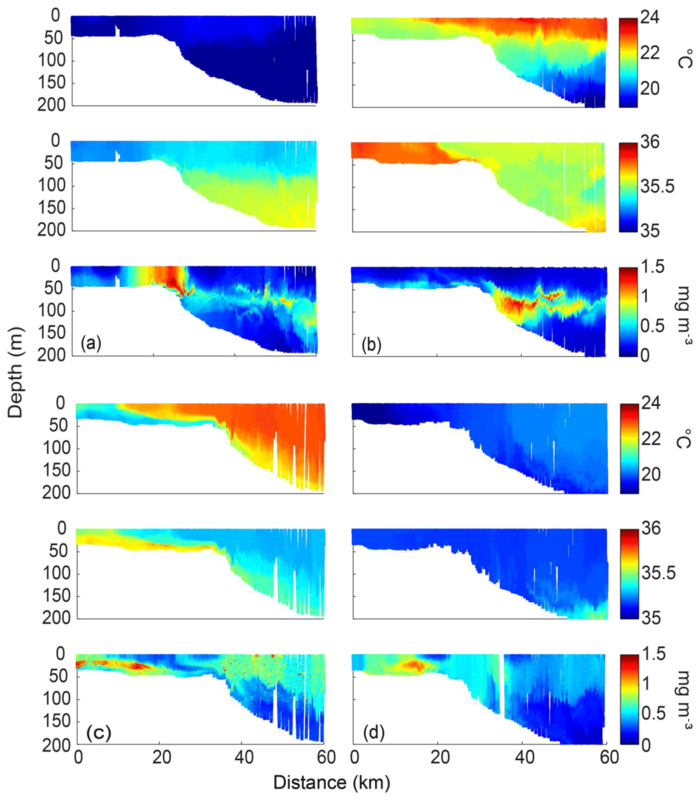 In this paper, we present an extensive, multi-year, ocean glider dataset, obtained along a representative cross-shelf transect along the Rottnest continental shelf (RCS), south-west Australia, to explore the seasonal and inter-annual variability of water column properties (temperature, salinity, and chlorophyll fluorescence distribution). Although ocean gliders have been sampling the oceans for more than a decade, sustained observations addressing the variability at the seasonal and inter-annual timescales from continental shelf regions are almost non-existent and this study addresses this shortcoming. Changes in phytoplankton biomass at seasonal and inter-annual timescales are important components of the total variability associated with biological and biogeochemical ocean processes (Ghisolfi et al., 2015). The circulation along the Western Australian coast has been studied through observations and the use of ocean models (Gersbach et al., 1999; Feng et al., 2003; Twomey et al., 2007; Woo and Pattiaratchi, 2008; Wijeratne et al., 2018); however, methods to study the biological processes in the water column have been limited to the use of satellite ocean colour data (Moore et al., 2007; Lourey et al., 2012) and limited shipborne observations (Hanson et al., 2005; Pearce et al., 2006; Koslow et al., 2008). Satellite imagery is limited to processes at the sea surface as sensors are unable to image subsurface waters due to limitations in light penetration. Information on the role of physical forcing and the biological responses in the water column has been limited because of the absence of a comprehensive observational dataset. In south-west Australia the majority of the available oceanographic and biological data are restricted in time and space and are thus unsuitable to be used to study seasonal and inter-annual patterns. Eastern boundaries of ocean basins are typically associated with upwelling of nutrient-rich water into the euphotic zone leading to high primary productivity on the continental shelf and rich coastal fisheries (Codispoti, 1983). Oceanographic conditions off the RCS are dominated by the Leeuwin Current (LC) that suppresses upwelling and transports nutrient-poor water along the continental shelf and has a negative impact on primary productivity (Koslow et al., 2008; Twomey et al., 2007). The absence of upwelling and major river systems means that the region is low in nutrients. For example, Twomey et al. (2007) reported that dissolved nitrate concentrations on the continental shelf and in the surface 50 m further offshore were typically below detection levels (<0.016 µM). Nitrate concentrations increased rapidly beyond 150 m depth to concentrations of around 30 µM. Thus the RCS is a nutrient-poor environment with nutrient supply limited to that through recycling during storms and offshore supply through eddy activity (Koslow et al., 2008). The RCS has several distinct bathymetric features (Fig. 1a): (1) a shallow inshore region (depths < 10 m), which can be defined as a “leaky” coastal lagoon with a line of discontinuous submerged limestone reefs (Zaker et al., 2007); (2) an upper continental shelf terrace with a gradual slope and a mean depth of ∼40 m, located ∼10–40 km from the coast; (3) an initial shelf break at the 50 m isobath; (3) a lower continental shelf between the 50 and 100 m isobaths, where the depth increases sharply; and (4) the main shelf break at the 200 m isobath. Figure 1(a) The study area. The dashed line denotes the location of the glider transect. Bathymetric contours are in metres; (b) tracks of all the Slocum ocean glider deployments from 2009 to 2015. The major current systems in the region are the Leeuwin and Capes currents (Woo and Pattiaratchi, 2008; Wijeratne et al., 2018). The LC is a warm lower-salinity poleward-flowing eastern boundary current, which mainly flows along the 200 m isobath (Ridgway and Condie, 2004; Pattiaratchi and Woo, 2009). In this oligotrophic environment lower chlorophyll and nutrient concentrations (Hanson et al., 2005; Twomey et al., 2007) and lower primary productivity (Hanson et al., 2007; Koslow et al., 2008) characterise the LC. The LC, which is strongest in autumn and winter, transports ∼5–6 Sv (sverdrup) of water during austral winter and ∼2 Sv during austral summer poleward (Feng et al., 2003; Wijeratne et al., 2018). El Niño and La Niña cycles influence the Leeuwin Current: the current is weaker during El Niño events and stronger during La Niña events (Pattiaratchi and Buchan, 1991; Wijeratne et al., 2018). Of interest to this study, the region experienced a marine heat wave in February and March 2011, which was associated with the warming related to the La Niña event defined as Ningaloo Niña (Feng et al., 2013). This event increased the Leeuwin Current's volume transport in February – an unusual event at this time of the year – and resulted in unprecedented warm sea surface temperature anomalies (∼5 ∘C higher than normal) off Australia's west coast (Feng et al., 2013). The Capes Current, which is dominant in summer, is a wind-driven inner-shelf current, generally formed in water depths < 50 m (Gersbach et al., 1999). 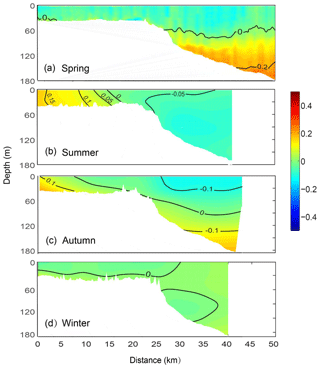 It transports cooler upwelling-derived water northward past Rottnest Island (Fig. 1) between October and March (Pearce and Pattiaratchi, 1999; Gersbach et al., 1999). Continental shelf processes along the Rottnest continental shelf are mainly wind driven, given the low diurnal tidal range (<0.6 m; Pattiaratchi and Eliot, 2009). The seasonal wind regime in the region can be divided into three regimes (Verspecht and Pattiaratchi, 2010; Pattiaratchi et al., 2011): (1) spring and summer (September–February) – strong daily sea breezes dominate with southerly winds often exceeding 15 ms−1; (2) autumn (March–May) – the transition from the summer to the winter regimes occurs, and wind speeds are usually low; and (3) winter (June–August) – storms occur frequently. Storm systems are associated with the passage of frontal systems with the region subject to peak wind speeds of 30 ms−1. These winds are generally north-westerly in winter and southerly in summer (Verspecht and Pattiaratchi, 2010). In the study region winter storms have a typical pattern with strong north and north-easterly components blowing for 12 to 52 h, followed by a period of similar duration when storms turn south and south-westerly with no prevailing direction dominating for the duration of the storm. Summer storms are southerly over a period of 3-4 days that are enhanced by the sea breeze system in the afternoon (Pattiaratchi et al., 1997; Gallop et al., 2012). Calm wind conditions are mainly observed during autumn and winter (March–August; between winter storm fronts) and are characterised by low wind speeds (<5 ms−1). Another major feature of the dynamics is the presence of dense shelf water cascade (DSWC) on the continental shelf (Pattiaratchi et al., 2011). Western Australia experiences high evaporation rates resulting in higher salinity (density) water in the majority of shallow coastal waters. This dense water is transported across the continental shelf close to the seabed due to the density difference between the nearshore and offshore water (Pattiaratchi et al., 2011; Mahjabin et al., 2019). It is a major mechanism for the export of water containing suspended material and chlorophyll away from the coastal zone. Analysis of ocean glider measurements by Pattiaratchi et al. (2011) indicated that DSWC is a regular occurrence along the RCS particularly during autumn and winter months. In autumn the dense water formation is mainly through changes in salinity resulting from evaporation whilst in winter, temperature was dominant through surface cooling. In summer, although there is a cross-shelf density (due to salinity) gradient, DSWC is not present due to wind-induced vertical mixing. The use of ocean gliders as an observational tool has several advantages over traditional ship-based surveys: ocean gliders have high sampling frequencies and long sampling durations (Pattiaratchi et al., 2017); the high temporal and spatial resolution data obtained with gliders may provide a better understanding of the links between the physical (meteorological and oceanographic) forcing and the phytoplankton response; all the relevant data are collected simultaneously and are not weather limited. We used a multi-year (2009–2015) ocean glider dataset (50 individual missions) along a repeated transect to examine the variability in the physical parameters and chlorophyll fluorescence concentration (a measure of phytoplankton biomass) distribution over seasonal and inter-annual timescales. The 7-year timescale included two El Niño events (2010 and 2014) and a strong extended La Niña event (2011–2013). The aims of this paper, through the analysis of the long-term ocean glider dataset, were to (1) examine the seasonal and inter-annual variability in chlorophyll fluorescence along the Rottnest continental shelf; (2) relate the seasonal chlorophyll fluorescence variability to changes in temperature and salinity distributions and local wind forcing; and (3) determine the influence of the ENSO cycles on chlorophyll fluorescence. This is the first long-term study of seasonal processes in the continental shelf waters along the RCS. This enables the identification of the main mechanisms that drive the variations in phytoplankton, as represented by chlorophyll fluorescence along the RCS. This paper is organised as follows. Sect. 2 describes the methods. The results of the seasonal winds and the monthly, seasonal, and inter-annual variations in the chlorophyll and physical properties are described in Sect. 3. In Sect. 4 we discuss the possible causes of the observed variability. A general conclusion is then given in Sect. 5. Water column data were obtained from repeated surveys undertaken using Teledyne Webb Research Slocum electric gliders (http://www.webbresearch.com/, last access: 29 March 2019) along the Two Rocks transect off Rottnest continental shelf, south-west Australia (Fig. 1). The Slocum ocean glider is 1.8 m long, 0.213 m in diameter, and weighs 52 kg. It is designed to operate in coastal waters of up to 200 m deep where high manoeuvrability is required under relatively strong background currents. Ocean gliders are autonomous underwater vehicles that propel themselves through the water by changing its buoyancy relative to the surrounding water (Rudnick, 2016). By alternately reducing and expanding their ballast volume, ocean gliders can descend and ascend through the ocean water column using minimal energy. In contrast to other similar automated ocean sampling equipment (e.g. Argo floats; http://www.argo.ucsd.edu/, last access: 29 March 2019), ocean gliders have wings, a rudder, and a movable internal battery pack allowing them to move horizontally in a selected direction in a sawtooth pattern. This allows for the horizontal position to be controlled and to sample particular regions of the ocean. The gliders are remotely controlled via the Iridium satellite system and navigate through waypoints, fixing their position via the Global Positioning System (GPS). Each time the glider surfaces, the data and new waypoints can be relayed via satellite to and from the glider. The autonomous nature of the ocean gliders means that they are able to collect data continuously irrespective of the weather conditions. The dataset was collected over a 7-year period (2009–2015); gliders are operated by the Integrated Marine Observing System (IMOS) ocean glider facility located at the University of Western Australia (Pattiaratchi et al., 2017). All the ocean glider data are available through the Australian Ocean Data Network (https://portal.aodn.org.au, last access: 29 March 2019; AODN Portal., 2019). More than 200 cross-shelf transects from ∼50 ocean glider missions were analysed with ∼28 million individual scans obtained for each variable (temperature, salinity, and chlorophyll). 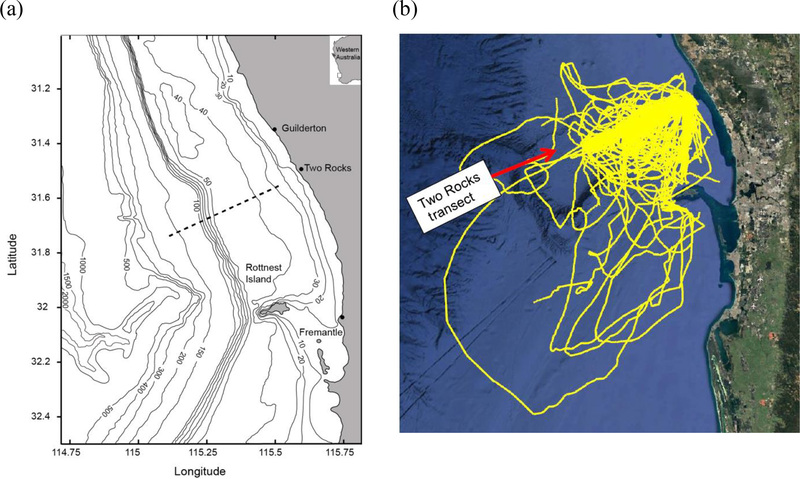 Each cross-shelf ocean glider transect took 2 to 3 days to complete (Pattiaratchi et al., 2011) with the gliders travelling at a mean speed of 25 km per day. The glider transects extended from ∼20 m depth contour to deeper waters (the gliders have a maximum depth range of 200 m) and collected data from the surface to ∼2 m above the seabed. The gliders were equipped with a Sea-Bird Scientific pumped CTD (conductivity–temperature–depth) sensor, a WETLabs BBFL2SLO 3 parameter optical sensor (which measured chlorophyll fluorescence, coloured dissolved organic matter, and backscatter at 660 nm), and an Aanderaa oxygen optode. All the sensors sampled at 4 Hz (which yielded measurements about every 7 cm in the vertical). The actual vehicle trajectory was transposed onto the Two Rocks transect as a straight line (Pattiaratchi et al., 2011). IMOS data streams are provided in NetCDF-4 format with ocean glider data files containing meta-data and scientific data for each glider mission. Subsequent to the ocean glider recovery, all the data collected by the glider are subject to quality assurance and quality control (QA/QC) procedures that include a series of automated and manual tests (Woo, 2017). To maintain data integrity, all of the sensors (CTD and optical sensors) are returned to the manufacturers for calibration after a period 365 days in the water. The Sea-Bird Scientific SBE 41CP pumped CTD sensor on the Slocum gliders is the same as those mounted on Argo floats and achieve temperature and salinity accuracies of ±0.002 ∘C and ±0.01 salinity units, respectively. The WETLabs BBFL2SLO 3 fluorescence values were estimated using the conversions provided by the manufacturer. A recent study by Beck (2016) found that, through inter-comparison between chlorophyll a derived from HPLC (high performance liquid chromatography) and WETLabs BBFL2SLO 3 fluorescence on ocean gliders, the original manufacturer's recommendation for the estimation of chlorophyll a from fluorescence provided the best estimate. As part of the QA/QC procedures applied to the WETLabs BBFL2SLO 3 Eco Puck sensor on the Slocum, gliders are subject to a series tests to track their performance, to identify errors, and to quantify drift during missions due to biofouling and/or damage. These tests were undertaken in the laboratory prior to shipping of the glider, immediately prior to deployment on the vessel, and then immediately on recovery before cleaning of the sensor face. The tests were carried out by attaching a solid standard in a holder a set distance from the sensor face and collecting engineering counts from the fluorescence, CDOM (coloured dissolved organic matter), and backscatter signals over a 5 min period. The solid standards used for fluorescence and CDOM counts, Plexiglas Satinice® plum 4H01 DC (polymethylmethacrylate, Evonik Industries), were identified by Earp et al. (2011) in a review of fluorescent standards for calibration of optical instruments as being the optimum. The ocean glider deployments started in 2008 and performance of ECO Puck sensors has been documented over this period. This included comparing consecutive scale factors following factory calibrations. Our records demonstrated the inherent stability of these sensors in their fluorescent and backscatter measurements with the difference between fluorescence scale factors between calibrations over 8 years of service typically <6 %. To measure the reliability of the instruments between factory calibrations, the fluorescent response of the instruments to a fluorescein concentration curve has been tracked between factory calibrations. We have also undertaken field measurements (Thomson et al., 2015) where a glider was attached to a rosette sampler and collected concurrent data from the glider and Niskin bottles at the surface, mid-depth, and bottom of the water column in 100 m depth. Water samples were subjected to HPLC analyses to determine the “true” Chlorophyll a concentrations. The comparison between WETLabs BBFL2SLO 3 derived fluorescence and the HPLC chlorophylla concentrations was very good with a correlation (r2) value of 0.75 (n>100) in the range 0.17 to 0.21 mg m−3. Wind speed and direction, recorded at 30 min intervals, were obtained from the Bureau of Meteorology weather station at Rottnest Island, and located ∼40 km south of Two Rocks transect (Fig. 1a). The focus of this paper is on the seasonal and inter-annual variability in the temperature, salinity, and chlorophyll fluorescence concentrations across the Two Rocks transect. It was assumed that processes along this transect were representative of the cross-shelf variability across the Rottnest continental shelf. When we refer to the “chlorophyll concentration” (units mg m−3), we are referring to the chlorophyll fluorescence as recorded by the BBFL2SLO optical sensor. Salinity is expressed as a dimensionless quantity. When examining the seasonal changes it was found that the changes in the mean values obscured the seasonal variability of each parameter (temperature, salinity, and chlorophyll). Hence, in addition to presenting the measured values (see Fig. S1 in the Supplement) we also calculated anomalies to remove the influence of the seasonal variability. The procedure for each parameter (∼28 million individual points) was as follows: (1) data were interpolated onto a common grid across the cross-shelf transect; (2) transects were then sorted according to season: spring (September–November), summer (December–February), autumn (March–May), and winter (June–August); (3) the mean value across the whole transect (i.e. through water depth and across distance) for each season was calculated (Table 1); and (4) the anomaly at each grid point was calculated by subtracting the seasonal mean from values at each point. Table 1Mean values of temperature, salinity, and chlorophyll fluorescence for each season used to calculate the cross-shelf anomalies. 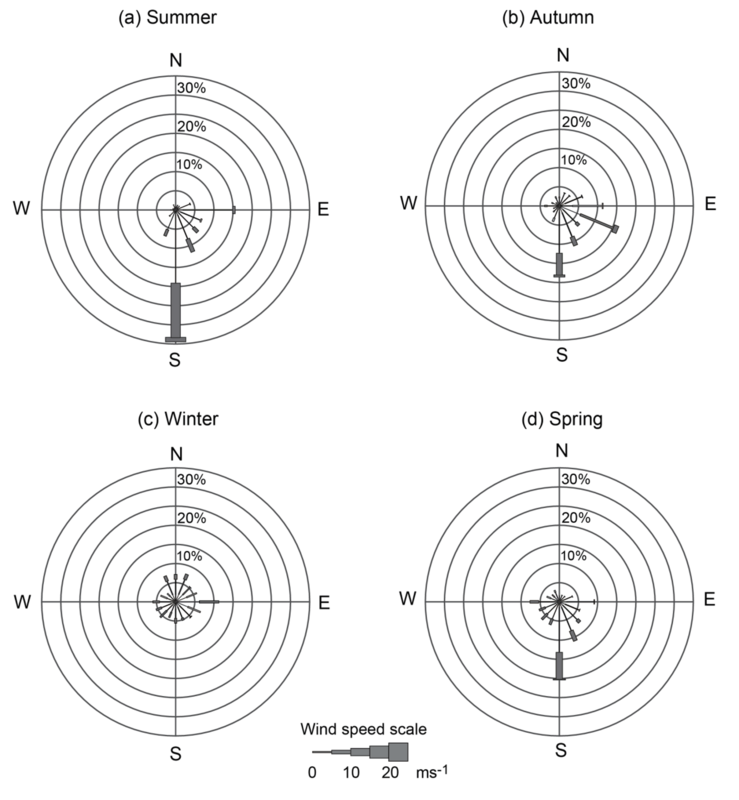 The mean winds for each season from March 2010 to March 2014 showed that southerly winds were prevalent in summer, autumn, and spring, followed by south and south-easterly winds (Fig. 2). Summer storms, which were usually associated with southerly winds, lasted up to 36 h with speeds > 25 ms−1. The sea breeze usually contributed to the southerly winds, which reinforced the prevailing southerly winds found in the seasonal rose plots (Fig. 2). 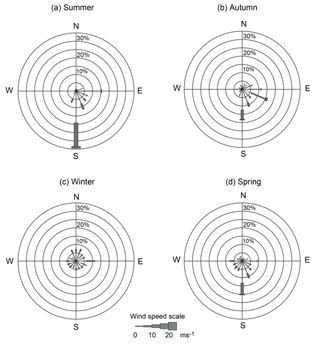 In autumn the wind speeds decreased (<13 ms−1), whereas in winter the winds had no prevailing direction. This is typical of winter storms, which are associated with rapid changes in the wind direction (Verspecht and Pattiaratchi, 2010). In spring, the winds were southerly with mean wind speeds of 15 ms−1. The southerly winds in the study region are upwelling favourable. 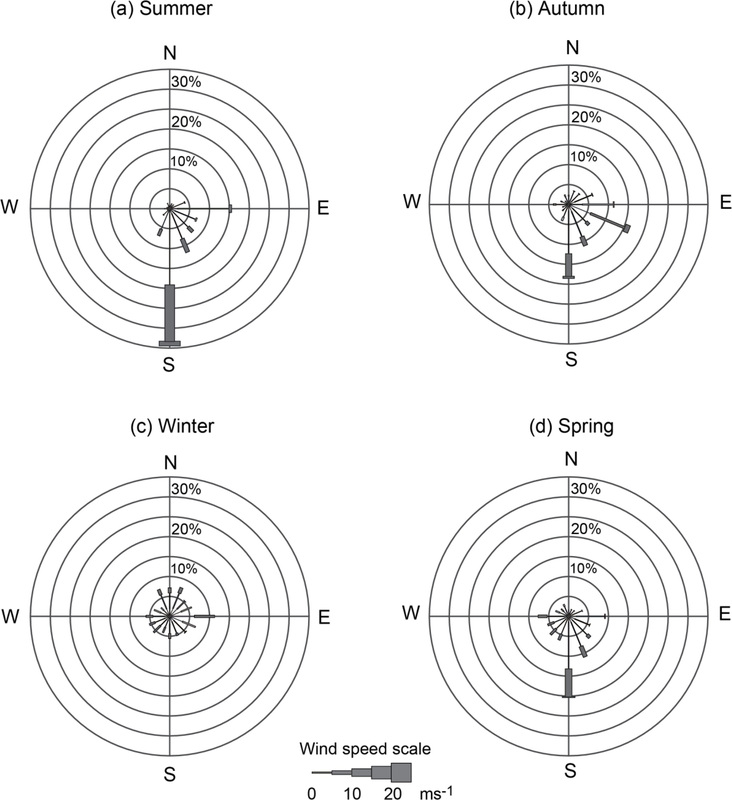 Figure 2Seasonal wind rose climatology for 2010–2014. 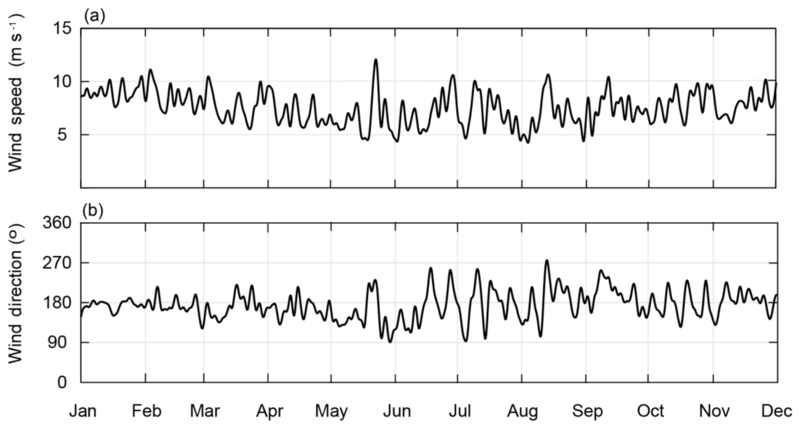 The time series of the daily mean wind speeds and directions in 2010 revealed the changes that occurred in the wind regime: from November to May (the summer regime), the winds were generally southerly, and the mean wind speeds were ∼7.5 ms−1 in November and ∼10 ms−1 in January and February (Fig. 3). The wind speeds decreased between March and mid-May (the autumn regime), with few changes in the wind direction. Between mid-May and October (the winter regime), winter storms caused large fluctuations in the wind speed and direction. 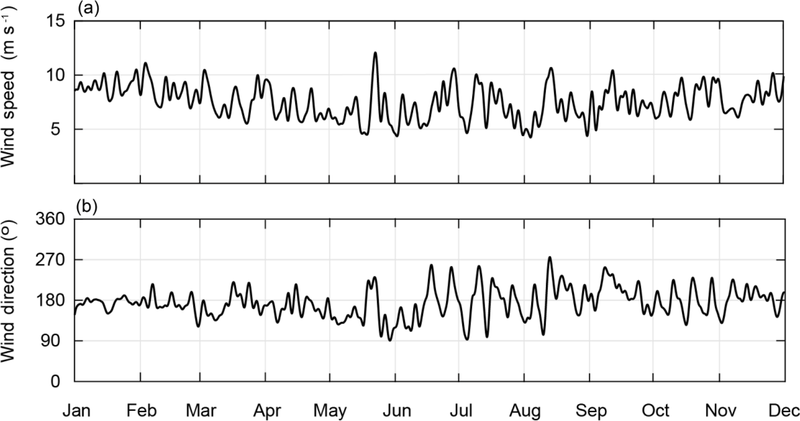 Figure 3Time series of (a) mean daily wind speeds and (b) wind direction in 2010 recorded at the Rottnest Island meteorological station (Fig. 1). Typical cross-shore distributions of the seasonal variation in temperature, salinity, and chlorophyll along the Two Rocks transect during spring, summer, autumn, and winter are shown in Fig. 4. In spring (21–23 October 2013), the temperature and salinity in the upper 80 m were vertically mixed across the whole shelf. The temperature and salinity characteristics changed at the shelf break. On the upper continental shelf (<40 m depth), the inshore waters were cooler and less saline than the offshore waters (Fig. 4a). High chlorophyll concentrations (up to 1.2 mg m−3) were found on the inner shelf and at the 50 m shelf break (Fig. 4a), which corresponded to temperature and salinity gradients (i.e. frontal system) in the same region. A thin layer (<10 m) of subsurface chlorophyll maximum (SCM, up to 1 mg m−3) extended from the shelf break to offshore, and coincided with the halocline (and pycnocline) at about 80 m depth. In summer (28 February–3 March 2014), a plume of warm Leeuwin Current water (∼23.5 ∘C) was located in the top ∼30 m between 60 and 70 km offshore (Fig. 4b). This plume cooled (to 23 ∘C) and thinned (in the top ∼5 m) as it moved inshore. Water on the upper continental shelf was cooler than that offshore. The salinity on the upper continental shelf (∼35.7) was slightly higher than offshore (35.5); the Capes Current most likely caused the cooler and saltier inshore waters. The cooler and saltier water on the upper continental shelf revealed that higher-density water was present on the shelf and a small DSWC was present inshore of the shelf break. A subsurface chlorophyll maximum (up to 1.2 mg m−3), between 50 and 110 m depths (at the pycnocline), was located from the shelf break to offshore. Figure 4Cross-shelf transects of temperature (∘C), salinity, and chlorophyll (mg m−3) obtained along the Two Rocks transect in (a) spring (21–23 October 2013); (b) summer (28 February–3 March 2014); (c) autumn (18–21 May 2009); and (d) winter (9–11 August 2012). In autumn (18–21 May 2009), the nearshore waters were saltier and cooler (21 ∘C) than the offshore waters (22.5 ∘C) (Fig. 4c). The offshore waters were well mixed except in the bottom 20 m. A plume of salty (35.7) and cooler (21 ∘C) water, which extended to ∼60 km across the entire continental shelf and depths > 180 m, was observed inshore and indicated the presence of a DSWC. The maximum chlorophyll concentration (1.3 mg m−3) was located on the upper continental shelf in the shallow pycnocline. The chlorophyll levels were generally higher in the DSWC than they were in the surface waters on the upper continental shelf. In the offshore waters, higher chlorophyll water was uniformly distributed in the surface mixed layer to depths of 60 m close to the shelf break and depths > 120 m farther offshore (Fig. 4c). In winter (9–11 August 2012), the temperature increased from 18 ∘C inshore to 20.7 ∘C offshore, and the water column was generally vertically mixed (Fig. 4d), except between 10 and 20 km on the upper continental shelf. The salinity was uniformly distributed inshore and in most offshore regions. Maximum chlorophyll (>1 mg m−3) concentrations were found along the inner shelf between 10 and 20 km and corresponded to the region of vertical and horizontal temperature and salinity gradients. The ocean glider data indicated vertical and horizontal stratification across the shelf and the temperature and salinity distribution across the shelf changed seasonally. The temperature and salinity characteristics on the upper continental shelf were often different from those farther offshore. High chlorophyll concentrations were found in regions with strong temperature and salinity gradients and thus density. These maximum values occurred in the vertical (e.g. the SCM in summer and autumn) and the horizontal (e.g. at the shelf break in spring and winter). The monthly mean temperature and salinity for inshore and offshore waters (upper 40 m depth) were calculated, except during July, September, November, and December because only a single ocean glider transect was available in each of these months. The inshore waters were defined as the region where depth < 40 m, and offshore waters were defined as the region where depth > 40 m. The temperature and salinity structure indicated that from January to March (summer to early autumn), the inshore waters (<40 m depth) increased (∼21.1–23.0 ∘C) and the salinity decreased (35.81 to 35.77) (Fig. 5a). From March to August (autumn to winter), the temperature (23.0 to 19.0 ∘C) and salinity (35.77 to 35.22) both decreased. From August to January (winter to early summer), both temperature (18.9 to 21.1 ∘C) and salinity (35.22 to 35.8) increased. Offshore water (>40 m depth) showed a similar seasonal pattern to that of the inshore waters (Fig. 5b). Except that from January to March the salinity decrease in offshore waters (from 35.71 to 35.54) was larger compared to inshore waters, and from August to January the offshore water temperature dropped slightly before increasing to 21.0 ∘C. Figure 5Monthly averaged temperature–salinity diagram with the chlorophyll (Chl) values (mg m−3) for the Two Rocks transect between 2009 and 2015. The horizontal error bars indicate the standard deviation of salinity, and the vertical error bars indicate the standard deviation of temperature. Spatially averaged chlorophyll concentrations for the inshore waters revealed significant seasonal variability (Fig. 5a). Higher chlorophyll concentration values were reached between March and August (autumn to winter) with a maximum of 1.12 mg m−3 reached in May that decreased to a minimum of 0.36 mg m−3 in February. The chlorophyll concentration values for offshore waters were less variable with highest values in May (maximum of 0.85 mg m−3) and lowest in February (minimum of 0.43 mg m−3, Fig. 5b). Higher chlorophyll concentrations corresponded with warmer and less-saline water for both the inshore and offshore waters. Over the 7-year study period (January 2009–March 2015), the vertical structure of the seasonal mean data for the Rottnest continental shelf revealed variability in temperature, salinity, and chlorophyll concentrations. Anomalies are defined as departures from the seasonal average with positive (negative) values higher (lower) than the seasonal average. The anomalies allowed us to examine the relative changes in water properties across the whole transect for each season. Seasonal temperature anomaly in the continental shelf waters differed from those further offshore, seaward of the shelf break (Fig. 6). During spring, the temperature distribution showed water to be vertically well mixed on the upper continental shelf (Figs. 6a and S1a) and vertically stratified in depths > 40 m. The offshore water in the upper layer was warmer compared to water on the inner shelf. In summer, the warmer surface water extended across the entire continental shelf (Fig. 6b). Water along the middle of the shelf (5–20 km from the coast) was slightly cooler, most likely due to the influence of the Capes Current. In autumn and winter, the upper-shelf waters were cooler than the offshore waters. The temperature anomalies were mostly negative with the lowest values (−1 ∘C) attained close to the coast (between 0 and 7 km) (Fig. 6c and d). 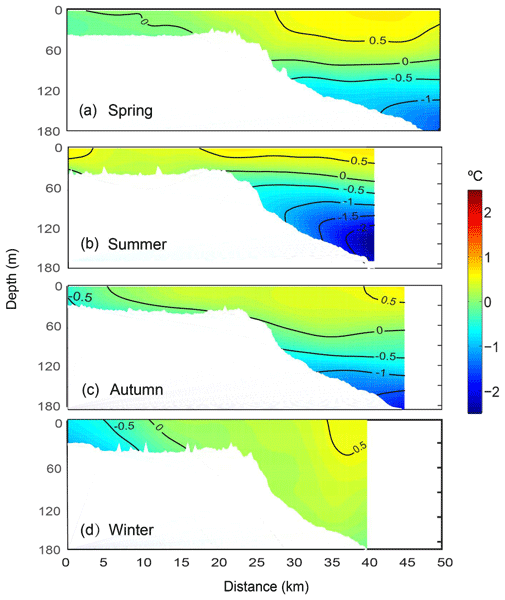 Figure 6Mean vertical structure anomaly of the temperatures (∘C) in (a) spring, (b) summer, (c) autumn, and (d) winter, averaged seasonally over distance and depth across the Rottnest continental shelf between 2009 and 2015. The largest variability in the offshore waters was associated with the thermocline depth (temperature anomaly of about −1.0 ∘C). In spring, the thermocline was almost horizontal and located at ∼120 m depth. In summer, the thermocline was located higher in the water column (∼70 m depth) with a slight inclination (deeper in the offshore). In autumn, the thermocline depth increased to 100 m with a more pronounced inclination. The thermocline inclinations in summer and autumn were most likely due to upwelling processes when the winds were upwelling favourable (Fig. 2). In winter, the thermocline was absent because the Leeuwin Current dominated the offshore waters. In summer and autumn, the salinity anomaly was higher on the upper shelf than in the offshore waters, mainly because of evaporation (Fig. 7b and c). A cross-shelf salinity gradient was also present. The salinity was more uniform in the surface waters offshore. In spring, high salinity water was present at >100 m corresponding to the colder water (Fig. 7a). In winter, salinity gradients were absent along the whole transect (Fig. 7d). Figure 7Mean vertical structure anomaly of the salinity in (a) spring, (b) summer, (c) autumn, and (d) winter, averaged seasonally over distance and depth across the Rottnest continental shelf between 2009 and 2015. The chlorophyll concentration anomalies revealed there there were seasonal variations in the upper-shelf and offshore waters (Fig. 8). Across the whole transect, high chlorophyll concentration anomalies were present in the subsurface waters (i.e. not at the surface) and along the upper shelf. In spring, the highest chlorophyll concentration anomaly was found at the shelf break (Fig. 8a) and was related to a horizontal temperature gradient (Fig. 6a). An SCM at ∼100 m depth was present in the offshore waters aligned with the vertical stratification in temperature, salinity, and density (Figs. 6a, 7a, and S4b). In summer, the SCM was concentrated over a smaller depth range (<50 m) in the offshore waters. On the continental slope, seaward of the shelf break (an area of 20–30 km), the chlorophyll concentration anomalies were more diffuse, most likely because of the variation in the upwelling and the diurnal cycle (Chen et al., 2017). In autumn and winter, the SCM was absent, but the chlorophyll concentration anomalies were higher on the upper continental shelf. The autumn chlorophyll distribution corresponded to the presence of DSWCs on the upper shelf (Figs. 7c and 8c). 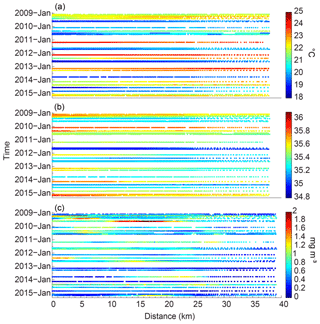 Figure 8Mean vertical structure anomaly of the fluorescence (mg m−3) in (a) spring, (b) summer, (c) autumn, and (d) winter, averaged seasonally over distance and depth across the Rottnest continental shelf between 2009 and 2015. We used a 7-year dataset of ocean glider deployments to examine the inter-annual variability in the temperature, salinity, and chlorophyll concentrations. Water properties were depth-averaged from the surface to 30 m depth (Fig. 9). The gliders traverse in a sawtooth pattern, and as the depth increases the surfacing spacing increases; thus there were gaps in the data for the deeper waters. All the water properties showed seasonal changes, but in this section we focus on the inter-annual variability. For example, the marine heat wave during the 2011 La Niña events is evident (red lines - summer 2011) as well as the cooler summers in 2009 and 2015 (yellow lines). Similarly, higher salinities were recorded during summers 2010, 2014, and 2015 that were associated with El Niño events (red lines). Figure 9Time–distance series of the (a) temperature (∘C), (b) salinity, and (c) chlorophyll (mg m−3), averaged for the top 30 m of water along the Rottnest continental shelf between January 2009 and March 2015. Zero distance (0 km) denotes the start of the glider transect. The year-to-year summer temperature range was >4 ∘C: the temperature was <20.1 ∘C in February 2010 and increased to a maximum of 24.4 ∘C in March 2011 and also in February 2012 (Fig. 9a). This maximum temperature was associated with the persistent La Niña event in 2011–2012. In winter, the year-to-year temperature range was >3 ∘C: the temperature was >21.2 ∘C in 2011 and decreased to a minimum of 18.4 ∘C in 2012 and 2014. The concurrent depth-averaged salinity time series showed that the waters were less saline (34.9) in August 2011 than they were in other years (Fig. 9b). In March 2015, the highest salinity value (∼35.9) was measured on the upper shelf. The lowest value (∼35.5) was attained in 2011 and was associated with the warmer water. The depth-averaged chlorophyll concentrations also had strong inter-annual variation (Fig. 9c) with values ranging from 0.81 mg m−3 in May 2009 and 2010 to 1.8 mg m−3 in May 2014. The largest range in the chlorophyll concentrations was from March 2011 (chlorophyll concentration of 0.88 mg m−3) to March 2014 (chlorophyll concentration of 0.14 mg m−3). The lowest value of 0.18 mg m−3 was also recorded in March 2013. Time series of the depth-averaged (surface 30 m) temperature, salinity, and chlorophyll measured 10 km from the coastline revealed strong seasonal and inter-annual variability, especially in response to El Niño and La Niña events (Fig. 10). Information presented in Fig. 10 includes the same as that shown in Fig. 9, except that variations at a single point (10 km) are shown as a time series. The seasonal cycle (Sect. 3.3; Fig. 5a) indicated warmer saltier water was present in summer and cooler less-saline water in winter. Figure 10Time series of the depth-averaged temperature, salinity, and chlorophyll 10 km from the start of the glider transects. In 2009/2010, a moderate El Niño event occurred, which resulted in lower temperatures and higher salinity during the first half of 2010. The El Niño weakened the Leeuwin Current, which entrained cooler saltier water into the region from offshore (e.g. Woo and Pattiaratchi, 2008). The chlorophyll values were ∼1 mg m−3, with a slight elevation in winter due to the seasonal bloom (Fig. 10). The 2009/2010 El Niño was followed by a strong extended La Niña between 2011 and 2014. The ocean glider data (Fig. 10) captured several El Niño and La Niña effects in the water column properties. (1) A maximum temperature (>24 ∘C) was recorded in February 2011, which was an increase of >4 ∘C from 2010. From 2011 to 2014, summer temperatures decreased. (2) A significant drop in salinity (>0.5) occurred from 2010 to 2011. This salinity decrease was mainly due to a stronger Leeuwin Current transporting lower-salinity water into the region. From 2011 to 2014, the salinity increased. (3) Chlorophyll decreased from ∼1 mg m−3 in 2011 to <0.25 mg m−3 in early 2014 and then increased in May 2014. The ocean glider data obtained from 17 to 28 April 2013 revealed that a storm caused vertical mixing in the water column and transported higher chlorophyll water from the SCM to the surface. The first two transects (17–20 April 2013) were collected under low wind (<5 ms−1) conditions (Fig. 11). The water column was vertically stratified across the whole transect with a DSWC present on the upper shelf (Fig. 12a and b). Higher chlorophyll water was present in the DSWC's bottom layer. In the deeper waters, the higher chlorophyll water was associated with the SCM (Fig. 12m and n). Figure 11(a) Wind speed (ms−1) and (b) wind direction (∘) along the Rottnest continental shelf between 12 and 30 April 2013. On 20 April, the winds increased to >10 ms−1. The winds were initially southerly and then changed to westerly and continued to be that way until 23 April (Fig. 11) causing vertical mixing of the water column. By 25 April, the water column on the upper shelf was vertically mixed (Fig. 12e and k). On 28 April, when the winds decreased, the water column on the upper shelf was vertically stratified in salinity (Fig. 12l). Figure 12Vertical cross-sections of (a–f) temperature (∘C), (g–l) salinity, and (m–s) chlorophyll (mg m−3) across the Rottnest continental shelf between 17 and 28 April 2013 obtained with the ocean glider. The winds and the vertical stratification also affected the chlorophyll distribution. Initially, high chlorophyll concentrations were found in the DSWC on the upper shelf close to the seabed and in the SCM in the offshore waters (Fig. 12m). As the winds increased, the chlorophyll concentration became uniform through the water column across the whole transect (Fig. 12q). Note that the wind, although not strong (∼10 ms−1), was able to mix the water column to ∼80 m depth in the offshore waters and erode the thermocline and thus the SCM. The SCM likely reformed (Fig. 12s); however, with reduced solar heating and convective cooling, the stratification would have weakened, which would have led to a well-mixed water column in late autumn and early winter. 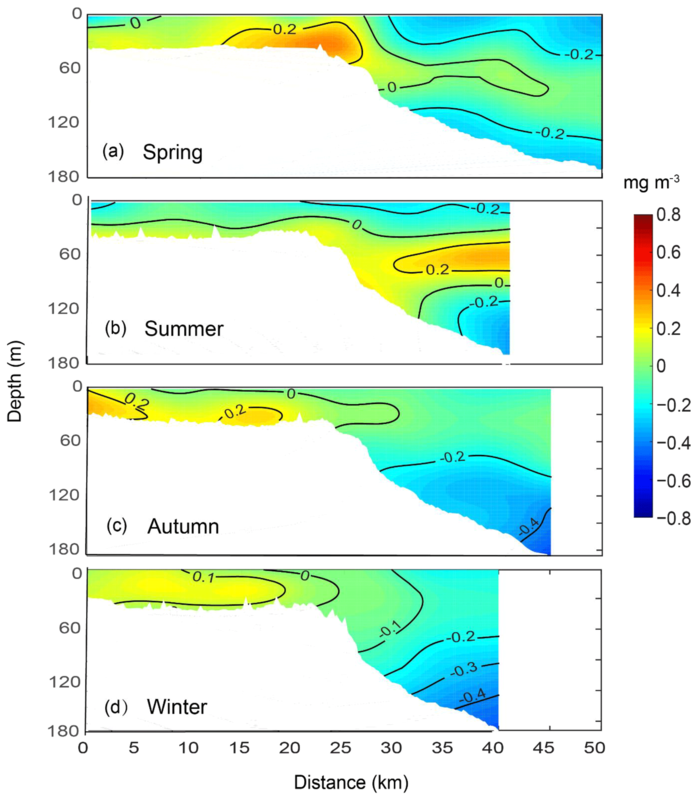 In this paper, simultaneous water column data of ocean properties (temperature, salinity, and chlorophyll fluorescence) together with meteorological data were used to examine the seasonal and inter-annual variability along the Rottnest continental shelf. Acquisition of multi-year sustained ocean observations using shipborne sampling is difficult (relative high cost and weather dependence) and thus many studies have used satellite remote sensing data of sea surface temperature and ocean colour to determine seasonal and inter-annual variability on continental shelves (e.g. Nieto and Mélin, 2017; Kilpatrick et al., 2018). Here, ocean glider data collected along a single transect along the RCS shelf over the period 2009–2015 indicated distinct seasonal and inter-annual variation in temperature, salinity, and chlorophyll concentrations. The study region is located at 32∘ S, close to the critical latitude (30∘ S), where the inertial period is 24 h. Because the diurnal sea breeze system also has a ∼24 h period, resonance occurs, which generates near-inertial waves (Mihanović et al., 2016; Chen, 2017). Field measurements revealed that near-inertial waves force the thermocline to oscillate at a diurnal timescale with a vertical excursion > 50 m (Mihanović et al., 2016; Chen, 2017). This vertical excursion of the thermocline causes the thermocline to migrate along the continental slope on a diurnal timescale. This process has a strong influence on the SCM interaction at the continental slope: the chlorophyll anomaly indicates higher concentrations along the slope between water depths of 50 m (shelf break) and 120 m (Fig. 8b). The study region is located in a Mediterranean climate zone with hot, dry summers and mild, wet winters. The annual evaporation rate exceeds 2 m per year (Pattiaratchi et al., 2011). There are no major land-based freshwater inputs to the region. Although the Swan River discharges at Fremantle, its freshwater component is low because rainfall is low during summer and autumn, and the river discharge is mainly deflected south in winter (Pattiaratchi et al., 2011). The combination of evaporation and cooling is such that in summer coastal heating and evaporation result in a band of warmer higher-salinity water close to the coast; in winter, the nearshore waters are cooler (through heat loss to the atmosphere) and less saline through mixing with offshore waters (Pattiaratchi et al., 2011). The impacts of all the physical forcing at the seasonal timescale were reflected in the temperature and salinity (T∕S) distribution across the shelf. The T∕S structure across the continental shelf showed that the water was warmest on the upper shelf between January and March whilst the salinity increased from January to March (Fig. 5). The warming was due to high solar insolation and the higher salinity through evaporation. From March to August, both the temperature and salinity decreased. This temperature decrease was due to heat loss to the atmosphere despite the transport of warmer water into the region by the Leeuwin Current. The salinity decrease was due to the advection of lower-salinity water from the Leeuwin Current. From August to January, both the temperature and salinity increased because of the increasing solar insolation and evaporation. The offshore waters showed a similar seasonal pattern. In general, both inshore and offshore chlorophyll concentrations were higher in autumn and winter (March to August) than they were in spring and summer. Maximum values were attained in May for the inshore (1.1 mg m−3) and offshore waters (0.85 mg m−3). The chlorophyll difference between summer and winter inshore (0.75 mg m−3) was larger than it was offshore (0.45 mg m−3). A similar seasonal pattern was found in studies conducted over the past two decades. Pearce et al. (2000) found that offshore chlorophyll concentrations between 1979 and 1986 were highest between May and August. Fearns et al. (2007) found a clear seasonal cycle with maximum values attained between May and July from 1997 to 2004. The main differences between spring/summer and autumn/winter were found in the water column structure, especially in the offshore regions. The offshore waters were vertically stratified in spring and summer and vertically mixed in autumn and winter (Figs. 6–8). The pycnocline in spring and summer initiated the SCM. Koslow et al. (2008) observed the summer SCM in a layer above the nutricline at 100 m depth when the water column was stratified. The nearshore autumn bloom coincided with the DSWCs, which regularly occur in autumn (Pattiaratchi et al., 2011). In winter, high chlorophyll concentrations were uniformly distributed inshore because of winter cooling and storm-induced mixing of the water column (Longhurst, 2007; Koslow et al., 2008; Chen et al., 2017). Our results are in broad agreement with those of Koslow et al. (2008), who used ship-based sampling data and satellite remote sensing data to study phytoplankton in the same region. Koslow et al. (2008) found that (1) the primary productivity and chlorophyll concentrations were lower offshore in summer when the water column was stratified and most of the chlorophyll was contained in the SCM; (2) phytoplankton blooms in late autumn and winter coincided with the period when the Leeuwin Current flow was strongest, and the winter bloom was due to cooling and storms, which promoted mixing of the upper water column. We also observed higher autumn and winter chlorophyll concentrations and a vertically mixed upper water column in the offshore region. In addition, the surface chlorophyll features agreed with Kämpf and Kavi (2017), who show widespread phytoplankton blooms (chlorophyll concentrations ∼1 mg m−3) during autumn and winter using satellite data along the southern Australian coastline. One of the unique features of the study region is that it does not follow well-established processes and seasonality like in other regions globally. Although the study region is located in an eastern ocean basin – it is not a major upwelling region (similar to off Peru/Chile or South Africa). This is mainly because of the presence of the Leeuwin Current which flows southwards against the prevailing upwelling-favourable winds that promotes downwelling (Pattiaratchi and Woo, 2009). Rossi et al. (2013) applied a composite dynamical upwelling index that accounted for the role of alongshore pressure gradients counteracting the coastal Ekman divergence. The results indicated that upwelling was sporadic along the whole Western Australian coast with the occurrence of transient upwelling events lasting 3–10 days changing in space and time. The study region (at 31.5∘ S) consisted of up to 12 upwelling days per month during the austral spring/summer. The intensity of intermittent upwelling was influenced by the upwelling-favourable winds, the characteristics of the Leeuwin Current, and the local topography. Thus the system is very different to other eastern boundaries. Also, maximum chlorophyll values presented here are a factor of 10 lower than those observed off South Africa. In addition to this, maximum chlorophyll levels were observed during late autumn and early winter and thus not during the period when upwelling-favourable southerly winds are present. In summer the most persistent feature was the subsurface chlorophyll maximum when strong upwelling-favourable winds occurred. Autumn was characterised by low wind speeds and winter does has not contain any persistence in the prevailing winds (see Figs. 2 and 3). Although other upwelling regions such as off Peru and South Africa do respond to ENSO events, mainly due to changes in the wind field, here the response is mainly due to changes in the strength of the Leeuwin Current that determined changes in the chlorophyll concentrations rather than upwelling. An indication of the role of the Leeuwin Current and the wind regime influencing the chlorophyll concentrations are highlighted in the autumn peaks in 2009 and 2014. The LC is strongest in autumn and winter (mean transport: ∼5–6 Sv) and weaker during summer (mean transport: ∼2 Sv). Wijeratne et al. (2018) presented results of boundary current transport around Australia from a high-resolution simulation over a 15-year period. The transport across a cross-shelf section at 31.5∘ S extending to the deeper ocean indicated that in January and February of 2009 and 2014 the southward mean monthly transport of the LC was very weak (<0.5 Sv). In contrast during the period 2010–2013 the monthly mean transport over these months was >1.0 Sv. Here, the weaker LC leads to a shallower mixed layer during the summer. Thus, when the storms arrive in late autumn the shallow mixed layer is broken down more easily bringing nutrients onto the upper layer that allows for higher phytoplankton growth and thus higher chlorophyll. The vertical mixing by storms were highlighted in Fig. 12. Also the number of major storms that impacted the study region over the period April–June were as follows: seven in 2009, two in 2010, five in 2011, zero in 2012, five in 2013, and seven in 2014, i.e. the years 2009 and 2014 had more storms compared to other years. The autumn chlorophyll concentrations in 2009 and 2014 were related to a weaker LC and the incidence of increased number of storms. In summary, the observed patterns of seasonal variability in the chlorophyll concentrations were related to the changes in the water's physical properties, which were affected by the seasonally changing physical forcing. These findings were similar to the study by Vidal et al. (2017) of the Iberian continental shelf, which is a region with similar dynamics (e.g. eastern poleward boundary current, upwelling-favourable winds) to the Rottnest continental shelf. Vidal et al. (2017) found that the physical forcing's frequency and intensity affected the chlorophyll variability. In spring and summer, the offshore waters were vertically stratified with a surface mixed layer and a well-defined pycnocline; the Leeuwin Current was weak and located farther offshore (Pearce and Pattiaratchi, 1999). The strong sustained winds mixed the upper water column to >50 m depth. The pycnocline prevented nutrients moving from beneath the pycnocline; however, the high light intensity penetrating into this region allowed the SCM to form. At the shelf break, the pycnocline moving along the slope and on the upper shelf caused higher chlorophyll concentrations at the shelf break and in the bottom layer. In spring, the higher chlorophyll concentrations at the shelf break were located where there were temperature gradients between the upper shelf and the offshore waters (i.e. a shelf break thermal front was present; Figs. 6 and 8). The ocean glider dataset collected between 2009 and 2015 revealed strong inter-annual variability in the region (Fig. 10). Pearce and Feng (2013) analysed large-scale (monthly) satellite-derived sea surface temperature data and found that coastal water temperatures off south-west Australia varied inter-annually and were linked to the ENSO cycle. During La Niña events, a strong Leeuwin Current transported warm water southwards (Pattiaratchi and Buchan, 1999; Pearce and Phillips, 1988; Feng et al., 2003, 2008), whereas during El Niño events the Leeuwin Current was weaker with generally lower water temperatures (Pattiaratchi and Buchan, 1991; Pearce et al., 2006). Several ENSO events occurred during the study period (http://www.bom.gov.au/climate/enso/lnlist/, last access: 29 March 2019): (1) the 2009–2010 El Niño; (2) the 2010–2013 La Niña; and (3) the 2014–2015 neutral conditions. The study region experienced a “marine heat wave” in February and March 2011, which was related to a La Niña event and defined as Ningaloo Niña (Feng et al., 2013). This event increased the Leeuwin Current's volume transport in February and caused high sea surface temperature anomalies (∼5 ∘C higher than normal; Feng et al., 2013). It affected extensions and contractions in species distributions and variations in recruitment and growth rates of species, and caused coral bleaching and the mass death of marine life with short-term and long-term impacts (Pearce et al., 2011). The glider data revealed that extreme depth-integrated (upper 30 m) temperatures (up to 3.5 ∘C above average) occurred in March 2011 and February 2012 (Fig. 9). The glider data captured the transition between the 2009–2010 El Niño and the extended 2011–2014 La Niña (Fig. 10). Large changes in the temperature (increase >4 ∘C) and salinity (decrease by 0.5) occurred between the El Niño and the La Niña events. The temperature decreased and the salinity increased over the same period with an accompanying decrease in the chlorophyll concentration from ∼1 mg m−3 in 2011 to <0.25 mg m−3 in early 2014. A strong Leeuwin Current, which transported warmer low-salinity low-nutrient water from the north to the south, affected the inter-annual variability in the temperature and salinity and most likely the chlorophyll concentration. A small decrease in the number of winter storms between 2011 and 2014 (Wandres et al., 2017) might also have reduced local recycling of nutrients (Chen et al., 2017). The extended impacts of the heat wave have a significant ecological impact, causing harm to temperate reef communities in Western Australia (Wernberg et al., 2016). The decrease in chlorophyll concentrations between 2011 and 2014 showed that the heat wave affected the pelagic and benthic ecosystems over an extended period. Wernberg et al. (2016) reported that the heat wave effects persisted for many years; and almost 5 years after the heat wave, the kelp forests had not recovered. 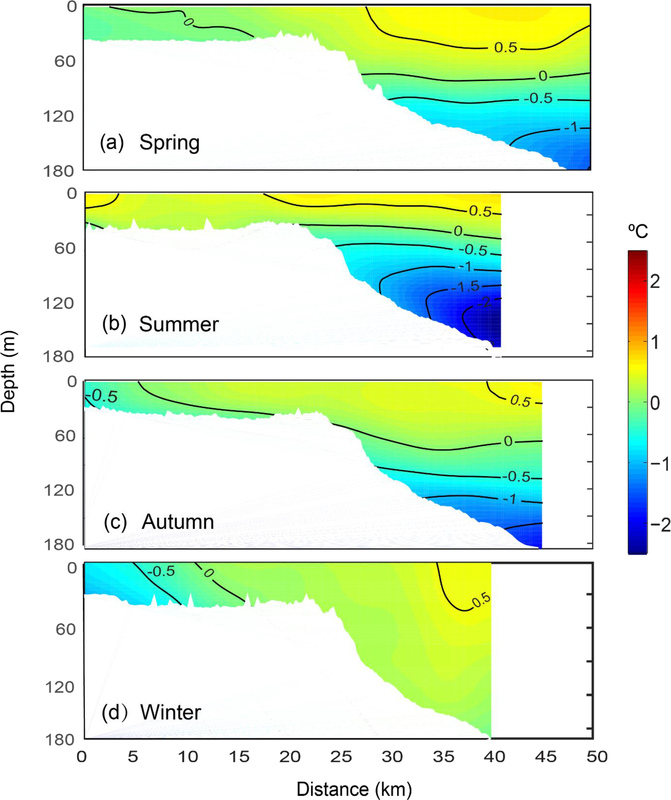 A 7-year high-resolution ocean glider dataset indicated that the temperature, salinity, and chlorophyll a distributions along the Rottnest continental shelf exhibited strong seasonal and inter-annual variability. Based on the results of the data analysis the following conclusions were reached. The seasonal variability was controlled by changes in the physical forcing that included winds, formation of dense shelf water cascades (DSWCs) and strength of the Leeuwin Current. The chlorophyll concentrations were higher during autumn and winter across the whole transect. During spring and summer months, the water column was vertically well mixed due to strong wind mixing. In autumn and winter, DSWCs were the main physical feature. Chlorophyll concentrations were higher closer to the seabed than at the surface during spring, summer, and autumn. In winter the chlorophyll concentrations were uniform through the water column. During spring and summer, months the water column was vertically stratified in temperature that contributed to the formation of a subsurface chlorophyll maximum (SCM). With the onset of storms in autumn, the water column was well mixed with the SCM absent. Inter-annual variation was associated with ENSO events. Lower temperatures, higher salinity, and higher chlorophyll concentrations were associated with the El Niño event in 2010. During the strong La Niña event in 2011, temperatures increased and salinity and chlorophyll concentrations decreased. Over subsequent years, the temperatures gradually decreased, the salinity increased, and the chlorophyll concentrations continued to decrease. In autumn of 2014, the chlorophyll concentrations increased. All the ocean glider data are available through the Australian Ocean Data Network (https://portal.aodn.org.au; AODN Portal, 2019). The supplement related to this article is available online at: https://doi.org/10.5194/os-15-333-2019-supplement. MC undertook the data analysis and produced the figures. MC and CP led the writing process with contributions from CH and AG. This paper is part of the PhD research of MC supervised by CP, CH and AG. The ocean glider data used in this paper were collected as part of the Integrated Marine Observing System (IMOS) by the ocean glider facility located at the University of Western Australia. IMOS is a national collaborative research infrastructure program, supported by the Australian Government through the National Collaborative Research Infrastructure Strategy (NCRIS). The meteorological data were obtained from the Bureau of Meteorology. Funding for this study was provided by International Postgraduate Research Scholarship, an Australian Postgraduate Award, and a University Postgraduate Award to Miaoju Chen. The authors acknowledge the support of Dennis Stanley, Paul Thompson, Kah Kiat Hong, and Mun Woo in the tasks associated with the deployment, recovery, piloting, and data QA/QC of the ocean gliders. This paper was edited by Mario Hoppema and reviewed by Jochen Kämpf and one anonymous referee. AODN Portal: Australian Ocean Data Network, https://portal.aodn.org.au/, last access: 29 March 2019. Beck, M.: Defining a multi-parameter optics-based approach for estimating Chlorophyll a concentration using ocean gliders, Unpubl. MSc Thesis, Dalhousie University, Dalhousie, Canada, 2016. 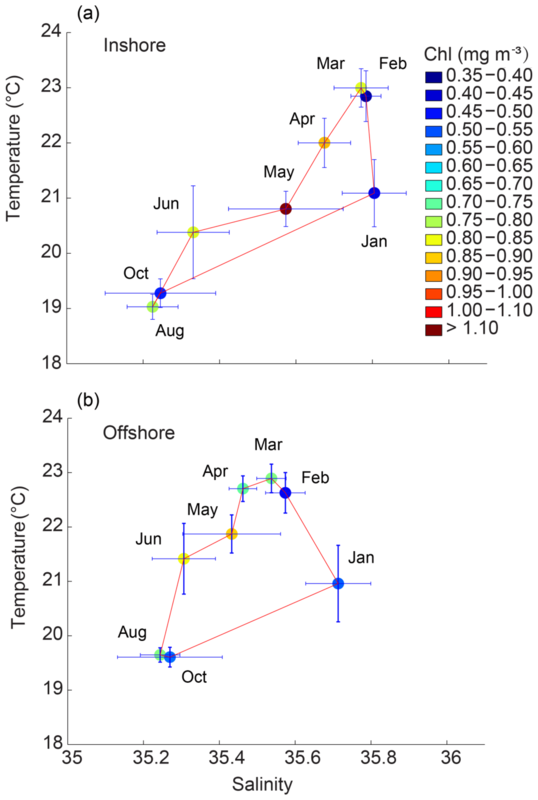 Cebrián, J. and Valiela, I.: Seasonal patterns in phytoplankton biomass in coastal ecosystems, J. Plankton Res., 21, 429–444, https://doi.org/10.1093/plankt/21.3.429, 1999. Chen, D., He, L., Liu, F., and Yin, K.: Effects of typhoon events on chlorophyll and carbon fixation in different regions of the East China Sea, Estuar. Coast. Shelf Sci., 194, 229–239, https://doi.org/10.1016/j.ecss.2017.06.026, 2017. Chen, M.: Chlorophyll response to physical forcing on the Rottnest Continental Shelf, PhD thesis, https://doi.org/10.26182/5be53372b96b3, 2017. Cloern, J. E. and Jassby, A. D.: Complex seasonal patterns of primary producers at the land–sea interface, Ecol. Lett., 11, 1294–1303, https://doi.org/10.1111/j.1461-0248.2008.01244.x, 2008. Codispoti, L. A.: Nitrogen in upwelling systems, in: Nitrogen in the Marine Environment, edited by: Carpenter, E. and Capone, D., Academic Press, New York, 513–564, 1983. Cushing, D. H.: The seasonal variation in oceanic production as a problem in population dynamics, ICES J. Mar. Sci., 24, 455–464, https://doi.org/10.1093/icesjms/24.3.455, 1959. Earp, A., Hanson, C. E., Ralph, P. J., Brando, V. E., Allen, S., Baird, M., Clementson, L., Daniel, P., Dekker, A. G., Fearns, P. R. C. S., Parslow, J., Strutton, P. G., Thompson, P. A., Underwood, M., Weeks, S., and Doblin, M. A.: Review of fluorescent standards for calibration of in situ fluorometers: recommendations applied in coastal and ocean observing programs, Opt. Express, 19, 26768–26782, 2011. Eppley, R. W.: Chlorophyll, photosynthesis and new production in the Southern California Bight, Prog. Oceanogr., 30, 117–150, https://doi.org/10.1016/0079-6611(92)90010-W, 1992. Fearns, P. R., Twomey, L., Zakiyah, U., Helleren, S., Vincent, W., and Lynch, M. J.: The Hillarys Transect (3): Optical and chlorophyll relationships across the continental shelf off Perth, Cont. Shelf Res., 27, 1719–1746, https://doi.org/10.1016/j.csr.2007.02.004, 2007. Feng, M., Meyers, G., Pearce, A., and Wijffels, S.: Annual and interannual variations of the Leeuwin Current at 32∘ S, J. Geophys. Res., 108, 3355, https://doi.org/10.1029/2002JC001763, 2003. 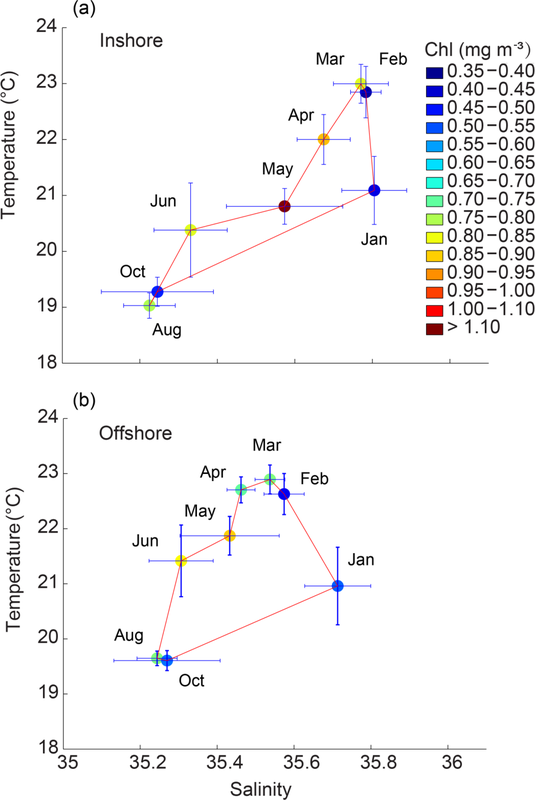 Feng, M., Biastoch, A., Böning, C., Caputi, N., and Meyers, G.: Seasonal and interannual variations of upper ocean heat balance off the west coast of Australia, J. Geophys. Res., 113, C12025, https://doi.org/10.1029/2008JC004908, 2008. Feng, M., McPhaden, M. J., Xie, S.-P., and Hafner, J.: La Niña forces unprecedented Leeuwin Current warming in 2011, Scient. Rep., 3, 1277, https://doi.org/10.1038/srep01277, 2013. Field, C. B., Behrenfeld, M. J., Randerson, J. T., and Falkowski, P.: Primary Production of the Biosphere: Integrating Terrestrial and Oceanic Components, Science, 281, 237–240, https://doi.org/10.1126/science.281.5374.237, 1998. Gallop, S. L., Verspecht, F., and Pattiaratchi, C. B.: Sea breezes drive currents on the inner continental shelf off southwest Western Australia, Ocean Dynam., 62, 569–583, https://doi.org/10.1007/s10236-011-0515-3, 2012. Garcia-Soto, C. and Pingree, R. D.: Spring and summer blooms of phytoplankton (SeaWiFS/MODIS) along a ferry line in the Bay of Biscay and western English Channel, Cont. Shelf Res., 29, 1111–1122, https://doi.org/10.1016/j.csr.2008.12.012, 2009. Gersbach, G. H., Pattiaratchi, C. B., Ivey, G. N., and Cresswell, G. R.: Upwelling on the south-west coast of Australia – source of the Capes Current?, Cont. Shelf Res., 19, 363–400, 1999. Ghisolfi, R. D., Silva, M. P. da, Santos, F. T. dos, Servino, R. N., Cirano, M., and Thompson, F. L.: Physical Forcing Mechanisms Controlling the Variability of Chlorophyll-a over the Royal-Charlotte and Abrolhos Banks – Eastern Brazilian Shelf, PLOS ONE, 10, e0117082, https://doi.org/10.1371/journal.pone.0117082, 2015. Hambright, K. D., Gophen, M., and Serruya, S.: Influence of long-term climatic changes on the stratification of a subtropical, warm monomictic lake, Limnol. Oceanogr., 39, 1233–1242, https://doi.org/10.4319/lo.1994.39.5.1233, 1994. Hanson, C. E., Pattiaratchi, C. B., and Waite, A. M.: Sporadic upwelling on a downwelling coast: Phytoplankton responses to spatially variable nutrient dynamics off the Gascoyne region of Western Australia, Cont. Shelf Res., 25, 1561–1582, https://doi.org/10.1016/j.csr.2005.04.003, 2005. Hanson, C. E., Pesant, S., Waite, A. M., and Pattiaratchi, C. B.: Assessing the magnitude and significance of deep chlorophyll maxima of the coastal eastern Indian Ocean, Deep-Sea Res. Pt. II, 54, 884–901, https://doi.org/10.1016/j.dsr2.2006.08.021, 2007. Huisman, J. and Weissing, F. J.: Light-Limited Growth and Competition for Light in Well-Mixed Aquatic Environments: An Elementary Model, Ecology, 75, 507–520, https://doi.org/10.2307/1939554, 1994. Kämpf, J. and Kavi, A. : On the “hidden” phytoplankton blooms on Australia's southern shelves, Geophys. Res. Lett., 44, 1466–1473, https://doi.org/10.1002/2016GL072096, 2017. Karsten, U., Barrow, K. D., Mostaert, A. S., and King, R. J.: The osmotic significance of the heteroside floridoside in the mangrove alga Catenella nipae (Rhodophyta: Gigartinales) in Eastern Australia, Estuarine, Coast. Shelf Sci., 40, 239–247, https://doi.org/10.1016/S0272-7714(05)80008-3, 1995. Kilpatrick, T., Xie, S.-P., Miller, A. J., and Schneider, N.: Satellite observations of enhanced chlorophyll variability in the Southern California Bight, J. Geophys. Res.-Oceans, 123, 7550–7563, https://doi.org/10.1029/2018JC014248, 2018. Koslow, J. A., Pesant, S., Feng, M., Pearce, A., Fearns, P., Moore, T., Matear, R., and Waite, A.: The effect of the Leeuwin Current on phytoplankton biomass and production off Southwestern Australia, J. Geophys. Res., 113, C07050, https://doi.org/10.1029/2007JC004102, 2008. Longhurst, A., Sathyendranath, S., Platt, T., and Caverhill, C.: An estimate of global primary production in the ocean from satellite radiometer data, J. Plankton Res., 17, 1245–1271, https://doi.org/10.1093/plankt/17.6.1245, 1995. Longhurst, A. R.: Ecological geography of the sea, 2nd Edn., Academic Press, Burlington, MA, available at: http://trove.nla.gov.au/version/42162902 (last access: 1 April 2019), 2007. 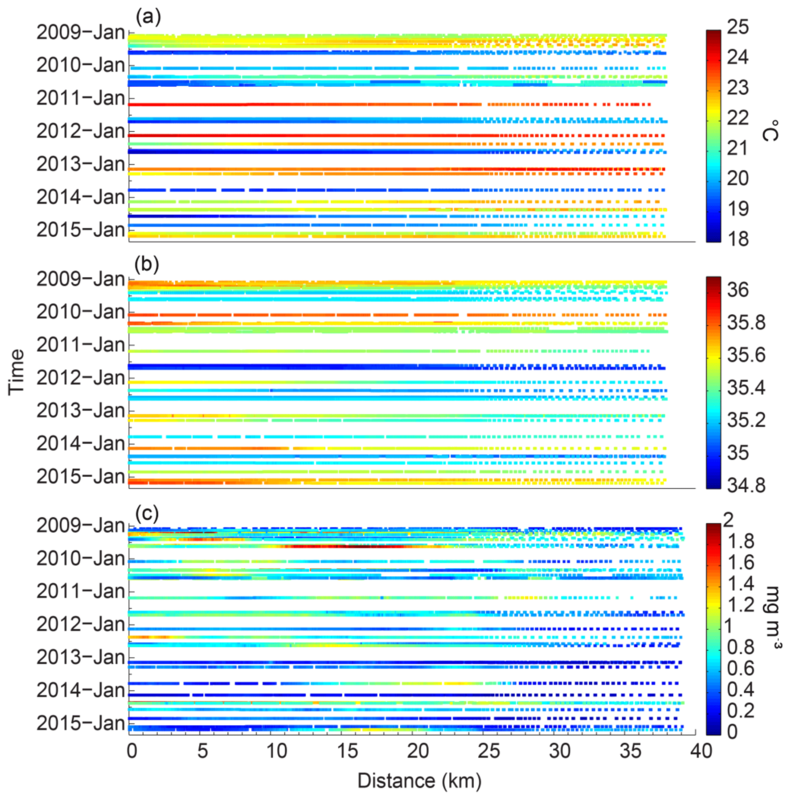 Lourey, M. J., Thompson, P. A., McLaughlin, M. J., Bonham, P., and Feng, M.: Primary production and phytoplankton community structure during a winter shelf-scale phytoplankton bloom off Western Australia, Mar. Biol., 160, 355–369, https://doi.org/10.1007/s00227-012-2093-4, 2012. 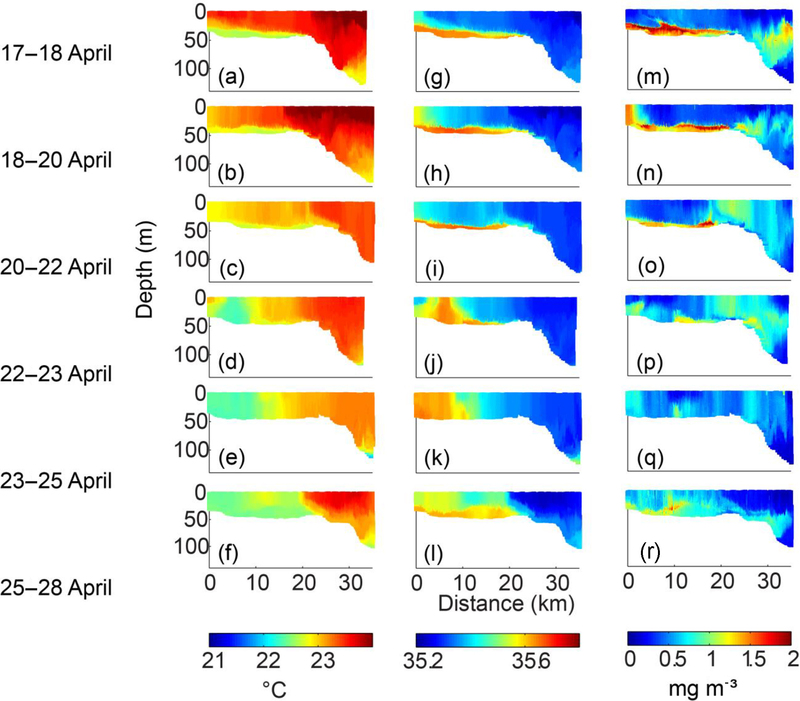 Mahjabin, T., Pattiaratchi, C. B., Hetzel, Y., and Janekovic, I.: Spatial and temporal variability of dense shelf water cascades along the Rottnest continental shelf in southwest Australia, J. Mar. Sci. Eng., 7, 30, https://doi.org/10.3390/jmse7020030, 2019. 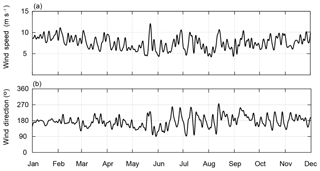 Mihanović, H., Pattiaratchi, C., and Verspecht, F.: Diurnal Sea Breezes Force Near-Inertial Waves along Rottnest Continental Shelf, Southwestern Australia, J. Phys. Oceanogr., 46, 3487–3508, https://doi.org/10.1175/JPO-D-16-0022.1, 2016. 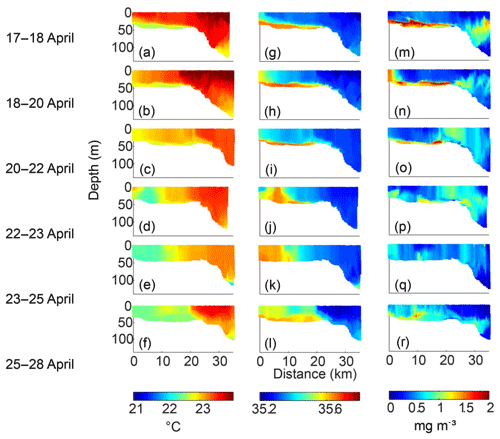 Moore, T. S., Matear, R. J., Marra, J., and Clementson, L.: Phytoplankton variability off the Western Australian Coast: Mesoscale eddies and their role in cross-shelf exchange, Deep-Sea Res. Pt. II, 54, 943–960, https://doi.org/10.1016/j.dsr2.2007.02.006, 2007. Nieto, K. and Mélin, F.: Variability of chlorophyll-a concentration in the Gulf of Guinea and its relation to physical oceanographic variables, Prog. Oceanogr., 151, 97–115, https://doi.org/10.1016/j.pocean.2016.11.009, 2017. Paerl, H. W. and Huisman, J.: Blooms Like It Hot, Science, 320, 57–58, https://doi.org/10.1126/science.1155398, 2008. Pattiaratchi, C. and Buchan, S.: Implications of long-term climate change for the Leeuwin Current, J. Roy. Soc. West. Austral., 74, 133–140, 1991. Pattiaratchi, C. and Eliot, M.: Sea level variability in South-West Australia: from hours to decades, World Scientific Publishing Company, Coast. Eng., 2008, 1186–1198, 2009. Pattiaratchi, C. and Woo, M.: The mean state of the Leeuwin Current system between North West Cape and Cape Leeuwin, J. Roy. Soc. West. Austral., 92, 221–241, 2009. Pattiaratchi, C., Micallef, S., Aiken, J., Osborne, M. J., Collins, M. B., and Williams, R.: Chlorophyll variability at ocean weather station Lima (57∘ N 20∘ W), in: Reproduction, genetics and distributions of marine organisms, edited by: Ryland, J. S. and Tyler, P. A., Olsen & Olsen, Fredensborg, 423–429, 1989. Pattiaratchi, C., Hegge, B., Gould, J., and Eliot, I.: Impact of sea-breeze activity on nearshore and foreshore processes in southwestern Australia, Cont. Shelf Res., 17, 1539–1560, https://doi.org/10.1016/S0278-4343(97)00016-2, 1997. Pattiaratchi, C., Hollings, B., Woo, M., and Welhena, T.: Dense shelf water formation along the south-west Australian inner shelf, Geophys. Res. Lett., 38, L10609, https://doi.org/10.1029/2011GL046816, 2011. Pattiaratchi, C., Woo, L. M., Thomson, P. G., Hong, K. K., and Stanley, D.: Ocean Glider Observations Around Australia, Oceanography, 30, 90–91, 2017. Pearce, A. and Pattiaratchi, C.: The Capes Current: a summer countercurrent flowing past Cape Leeuwin and Cape Naturaliste, Western Australia, Cont. Shelf Res., 19, 401–420, https://doi.org/10.1016/S0278-4343(98)00089-2, 1999. Pearce, A., Lenanton, R., Jackson, G., Moore, J., Feng, M., and Gaughan, D.: The “marine heat wave” off Western Australia during the summer of 2010/11, Fisheries Research Report No. 222, Department of Fisheries, Western Australia, 40 pp., 2000. Pearce, A., Lenanton, R., Jackson, G., Moore, J., Feng, M., and Gaughan, D.: The “marine heat wave” off Western Australia during the summer of 2010/11, Fisheries Research Report No. 222, Department of Fisheries, Western Australia, 40 pp., 2011. Pearce, A. F. and Feng, M.: The rise and fall of the “marine heat wave” off Western Australia during the summer of 2010/2011, J. Mar. Syst., 111–112, 139–156, https://doi.org/10.1016/j.jmarsys.2012.10.009, 2013. Pearce, A. F. and Phillips, B. F.: ENSO events, the Leeuwin Current, and larval recruitment of the western rock lobster, ICES J. Mar. Sci., 45, 13–21, https://doi.org/10.1093/icesjms/45.1.13, 1988. Pearce, A. F., Lynch, M. J., and Hanson, C. E.: The Hillarys Transect (1): Seasonal and cross-shelf variability of physical and chemical water properties off Perth, Western Australia, 1996–98, Cont. Shelf Res., 26, 1689–1729, https://doi.org/10.1016/j.csr.2006.05.008, 2006. Ridgway, K. R. and Condie, S. A.: The 5500-km-long boundary flow off western and southern Australia, J. Geophys. Res., 109, C04017, https://doi.org/10.1029/2003JC001921, 2004. Rossi, V., Feng M., Pattiaratchi, C., Roughan, M., and Waite, A. M.: On the factors influencing the development of sporadic upwelling in the Leeuwin Current system, J. Geophys. Res.-Oceans, 118, 3608–3621, https://doi.org/10.1002/jgrc.20242, 2013. Sverdrup, H. U.: On Conditions for the Vernal Blooming of Phytoplankton, ICES J. Mar. Sci., 18, 287–295, https://doi.org/10.1093/icesjms/18.3.287, 1953. Thompson, P. A., Bonham, P., Waite, A. M., Clementson, L. A., Cherukuru, N., Hassler, C., and Doblin, M. A.: Contrasting oceanographic conditions and phytoplankton communities on the east and west coasts of Australia, Deep-Sea Res. Pt. II, 58, 645–663, https://doi.org/10.1016/j.dsr2.2010.10.003, 2011. Thomson, P. G., Mantovanelli, A., Wright, S. W., and Pattiaratchi, C. B.: In situ comparisons of glider bio-optical measurements to CTD water properties, in: Australian Marine Sciences Conference, 5–9 July 2015, Geelong, Victoria, 2015. Twomey, L. J., Waite, A. M., Pez, V., and Pattiaratchi, C. B.: Variability in nitrogen uptake and fixation in the oligotrophic waters off the south west coast of Australia, Deep-Sea Res. Pt. II, 54, 925–942, https://doi.org/10.1016/j.dsr2.2006.10.001, 2007. Verspecht, F. and Pattiaratchi, C.: On the significance of wind event frequency for particulate resuspension and light attenuation in coastal waters, Cont. Shelf Res., 30, 1971–1982, https://doi.org/10.1016/j.csr.2010.09.008, 2010. Vidal, T., Calado, A. J., Moita, M. T., and Cunha, M. R.: Phytoplankton dynamics in relation to seasonal variability and upwelling and relaxation patterns at the mouth of Ria de Aveiro (West Iberian Margin) over a four-year period, PLOS ONE, 12, e0177237, https://doi.org/10.1371/journal.pone.0177237, 2017. Wandres, M., Pattiaratchi, C., and Hemer, M. A.: Projected changes of the southwest Australian wave climate under two atmospheric greenhouse gas concentration pathways, Ocean Model., 117, 70–87, https://doi.org/10.1016/j.ocemod.2017.08.002, 2017. Wernberg, T., Bennett, S., Babcock, R. C., de Bettignies, T., Cure, K., Depczynski, M., Dufois, F., Fromont, J., Fulton, C. J., Hovey, R., Harvey, E. S., Holmes, T. R. H., Kendrick, G. A., Radford, B. T., Santana-Garcon, J., Saunders, B. J., Smale, D. A., Thomsen, M. S., Tuckett, C. A., Tuya, F., Vanderklift, M. A., and Wilson, S.: Climate-driven regime shift of a temperate marine ecosystem, Science, 353, 169–172, https://doi.org/10.1126/science.aad8745, 2016. Wijeratne, S., Pattiaratchi, C., and Proctor, R.: Estimates of Surface and Subsurface Boundary Current Transport Around Australia, J. Geophys. Res.-Oceans, 123, 3444–3466, https://doi.org/10.1029/2017JC013221, 2018. Winder, M. and Cloern, J. E.: The annual cycles of phytoplankton biomass, Philos. T. Roy. Soc. B, 365, 3215–3226, https://doi.org/10.1098/rstb.2010.0125, 2010. Woo, M.: Australian National Facility for Ocean Gliders (ANFOG) Data Management User Manual, available at: http://imos.org.au/fileadmin/user_upload/shared/ANFOG/ANFOG_DataManagement_UsersManual_v5.01_Mar30.pdf (last access: 29 March 2019), 2017. Woo, M. and Pattiaratchi, C.: Hydrography and water masses off the western Australian coast, Deep-Sea Res. Pt. I, 55, 1090–1104, https://doi.org/10.1016/j.dsr.2008.05.005, 2008. 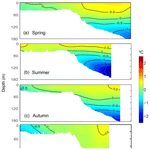 Zaker, N. H., Imberger, J., and Pattiaratchi, C.: Dynamics of the Coastal Boundary Layer off Perth, Western Australia, J. Coast. Res., 23, 1112–1130, 2007.